Understanding the learning objectives and examining how learning will look, feel and sound is an essential part of the assessment and evaluation process. Sharing evidence of critical digital literacies through your words, actions, and creations is how assessment in, of, for learning occurs. Students are asked to behave in this course and all other online interactions in a professional and civil manner. If you are in doubt, do not post it or do not say it! Instructors reserve the right to request the remove of any postings deemed inappropriate, unprofessional, or otherwise distracting. REVIEW the Rules of Netiquette and Norms of Collaboration. The ability to learn, understand, and retain knowledge has been demonstrated through the undergraduate degree required for entry into the Professional Year. The focus of the Professional Year is on building understanding of the issues and complexities of the teaching and learning process, and on gaining the skills necessary for becoming a successful teacher. Participation and self-direction are expectations. Learning is based on reflection, participation, and interaction, much of which takes place in collaboration with instructors, classmates, and mentors. Students who do not attend to tasks regularly will find their learning less engaging and their success will be compromised. The course outline, assessment descriptions are posted below and on the course web site. The Individual Grading Grid makes expectations and deadlines explicit. Tasks are considered late if not submitted by Friday of each week by 11:59 p.m. Late tasks are accepted only under rare, documentable circumstances, at the instructor’s discretion. Students are welcome to revise, redo and resubmit assignments within one week of the original submission due date in order to achieve a MET designation, in order to receive the mark for that task. 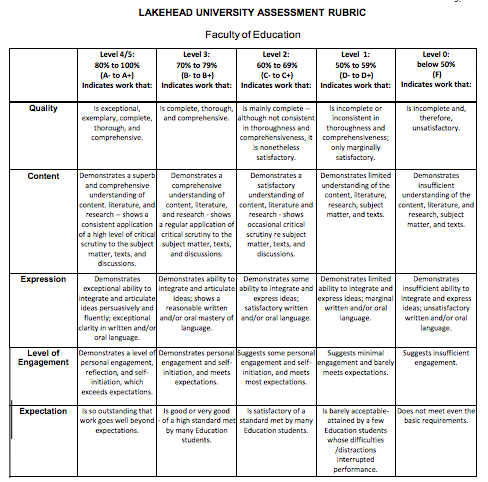 The Lakehead Faculty of Education rubric (found on page 13 of this Handbook) will be applied to the assessment and evaluation of the visible learning in this course. Feedback will be provided and incorporated into the next steps and levels of learning as the course progresses.